We could take or leave the bass section, and UVI needs to start writing proper manuals, but otherwise, this is a great start for the PX range. The first in its PX series of multisampled synthesiser curios, UVI's new soundbank for Falcon and the free UVI Workstation samples the extremely rare Moog Apollo synth (which never got past the prototype stage - only two are known to exist) to produce a loose recreation. 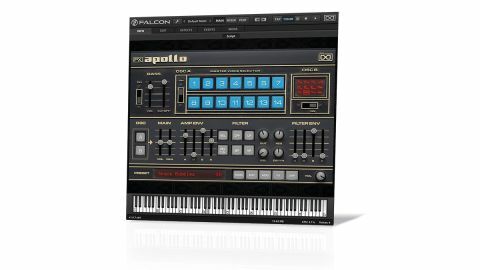 Like the original, PX Apollo features 14 preset patches, called up using Oscillator A's Master Voice Selector, and an optional 'left hand' bass section, switching the bottom three octaves over to a separate Bass oscillator. Oscillator B is a new addition - a phase distortion oscillator with 12 waveshapes. Beyond that, UVI's usual complement of effects, and filtering, modulation and arpeggio options are all in place, as is a library of about 150 presets. PX Apollo sounds gorgeous - warm, lively and very 'Moog' - and, despite being sample-based, includes more than enough animating and tone-shaping tools to satisfy the serious sound designer.